Have you ever wondered what it’s like to be a full-time artist or craftsperson? Join us at The Corning Museum of Glass from March 6 through 11 as we give you an unprecedented look into the lives and techniques of artists living, working, and making in and around Corning and New York. Throughout the week, flameworkers and hot glassmakers will demonstrate production-style making in the Amphitheater Hot Shop. During these demonstrations, you’ll witness first-hand the precision, dexterity, and speed required of six different artisans and studios. Then, come back to the Amphitheater on Thursday evening when the participating makers join us for an informal panel discussion. During this time, audience members can ask questions about everything from the processes and techniques of making, to the booking and selling of work after it’s made. At the end of the week, each artisan will have previously finished work available for purchase in the Makers Market and take one last turn demonstrating in one-hour time slots in the Amphitheater Hot Shop. Visit with the makers, see the work they create, and support a local artist. Glassmakers and flameworkers from the Hot Glass Demo team and The Studio will be standing by to answer all of your glassiest questions on #AskAMaker day on Twitter! See local artist Catherine Ayers in a live, narrated demonstration in the Amphitheater Hot Shop on March 7 from 10 am to noon, and 1 to 4 pm. See local artist Janet Dalecki in a live, narrated demonstration in the Amphitheater Hot Shop on March 8 from 10 am to noon, and 1 to 4 pm. See local artist Margaret Neher in a live, narrated demonstration in the Amphitheater Hot Shop on March 9 from 10 am to noon, and 1 to 4 pm. See local artists Michael Benzer and John Gilvey of Hudson Beach Glass in a live, narrated demonstration in the Amphitheater Hot Shop on March 9 from 10 am to noon, and 1 to 4 pm. Join us on Thursday, March 9 as we welcome six working glass artists from Corning and across New York State for a panel discussion on the challenges and rewards of working as artists. See local artist Thomas P. Kelly of Vitrix Hot Glass Studio in a live, narrated demonstration in the Amphitheater Hot Shop on March 10 from 10 am to noon, and 1 to 4 pm. See local artist Milon Townsend in a live, narrated demonstration in the Amphitheater Hot Shop on March 10 from 10 am to noon, and 1 to 4 pm. Enjoy samples from more than 25 local wineries and breweries during this annual winter tradition in our historic downtown! 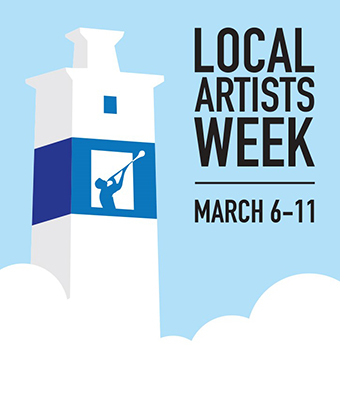 End Local Artists Week with a Makers Market in the Courtyard Lobby. Artisans who demonstrated the week will have finished work available for purchase and take one last turn demonstrating in the Amphitheater Hot Shop.